The 3-sol weekend plan starts with targeted remote science (ChemCam and Mastcam observations), then completion of the thorough wheel imaging campaign . The Sol 488 plan includes ChemCam and Mastcam observations of the Cumberland drill sample that was dumped in front of the rover, completing the campaign on the dump pile. I'm on my way home from the ChemCam team meeting, so again not involved in MSL tactical operations, but saw that the Sol 487 plan includes dumping the last of the Cumberland drill sample and MAHLI imaging of the dump pile. Last week's flight software upgrade went well, so the Sol 485 plan includes science activities. I'm uplink lead for the Opportunity Microscopic Imager and engineering cameras (Hazcams and Navcams) today, so have not been able to follow MSL planning as closely as usual. The drive planned for last weekend went well, so another drive is planned for Sol 472, along with targeted remote science and MAHLI imaging of the rover wheels. There was some concern about tears in the rover wheels , but today we got the go-ahead to drive, with no restrictions on distance or drive mode. I'm SOWG Chair again today, planning Sol 465, which includes the first drive since the electrical issue over a week ago. MSL science planning has resumed! Today we are planning 3 sols, with the focus on dropping more of the drill sample into 4 of SAM's cups, for future analysis. There will be no MSL science planning again today, as analysis of the recent electrical issue continues. I was scheduled as MAHLI/MARDI uplink lead today, but there was nothing to do because all science planning is on hold while the power issue is being investigated. The plan for last weekend included driving on 2 sols. I was SOWG Chair again planning Sol 452, which was disappointing because it was basically a repeat of Sol 451. I'm SOWG Chair today, but focused on tomorrow's plan because Sol 451 is dedicated to recovering from last week's software anomaly . There are no science observations planned this week while the rover flight software is upgraded. Planning started at 6:30 this morning to allow enough time to plan 3 sols before we have to send the command sequences to the rover by 19:00 this evening. The rover is very close to a low scarp that is the target for contact science this weekend. Last weekend's 3-sol plan included back-to-back drives on Sols 436 and 437. MSL planning is still restricted, so we won't get confirmation of the drive planned for Sol 431 in time for planning Sol 432, which is therefore an untargeted-remote-sensing sol. I forgot to mention previously that, unlike at other NASA Centers, JPL employees work for Caltech, not NASA directly. I apologize for the gap in these updates— the USGS web servers were turned off during the government shutdown. I'm in Pasadena this week for an MSL team meeting, but may have to return home tomorrow if the government is shut down. The autonomous navigation software could not find a safe path toward the rover's goal on Sol 404, so ended up in a configuration that prevented uplink of the Sol 405 command sequences directly to the high-gain antenna from Earth. The campaign at Waypoint 1 is complete, and MSL is back on the road toward Aeolis Mons ("Mt. Today is my last shift as SOWG Chair this week. The short drive to the next contact science location at Waypoint 1 was successful, so we planned a lot of MAHLI images and a couple ChemCam observations of the veins in front of the rover . MSL planning is restricted again this week, so Sol 397 was planned without knowing the position of the rover after the Sol 396 drive. The rover is in position to deploy the arm instruments on outcrops at Waypoint 1, so the weekend plan includes lots of APXS and MAHLI observations. I'm back from a week's vacation, catching up on everything that MSL has been doing. Autonomous navigation continues to work well, allowing longer drives into areas not visible from the previous rover location. The Sol 379 drive went well, and the rover is in a safe configuration for arm deployment. Autonomous navigation continues to work well, and Curiosity completed another long drive on Sol 378. The Sol 374 drive, including the AutoNav portion, went very well, so an even longer drive is planned for Sol 376. The autonomous navigation checkout, part of the Sol 372 drive, went perfectly! So "AutoNav" can be used for up to 90 minutes next time. The Sol 371 drive set a new MSL distance record for a single sol, 110 meters. Sol 372: Update On Curiosity From USGS Scientist Ken Herkenhoff: Record Drive! The Sol 370 drive went well, and the rover stopped near an interesting outcrop . After taking a week off from MSL tactical planning, I was back on shift as MAHLI/MARDI uplink lead yesterday, planning Sol 369. The Sol 356 drive went well, so another drive was planned for Sol 358. The MSL team is celebrating the first Earth year of operations on the surface of Mars, at JPL, on NASA TV , and at participating institutions around the world. Sol 356: Update On Curiosity From USGS Scientist Ken Herkenhoff: First Earth Year! MSL landed on Mars one Earth year ago tonight, so there were cheers and applause during the SOWG meeting today. The latest drive covered over 80 meters, and we are planning another drive on the second sol of the 3-sol weekend plan. The Sol 345 drive went well, totaling 60 meters. We were happy to see that the long drive planned for last weekend went well , but don't expect to drive so far every sol until more software capabilities are checked out and cleared for use. I'm SOWG Chair again, planning three sols to get the rover through the weekend. I've been SOWG Chair for the last three days of this week, planning drives every sol. Sol 336 Update On Curiosity From USGS Scientist Ken Herkenhoff: One Kilometer! MSL passed one kilometer total drive odometry during the Sol 335 drive! Hopefully the two kilometer mark will be passed much more quickly, as we are halfway through the nominal mission of one Mars year (669 sols). The first few drives toward Mt. I'm MAHLI/MARDI uplink lead today, planning Sol 329, which includes another drive toward Aeolis Mons ("Mt. We have started the long traverse to the base of Mt. We decided to spend a bit more time investigating the "Shaler" outcrop using the arm instruments and ChemCam before starting the long drive to Aeolis Mons or "Mt. "Contact science," including APXS and MAHLI close-up observations of a couple of rocks at the "Shaler" outcrop, are being planned for Sols 322 and 323. MSL continues to study the "Shaler" outcrop, slowed a bit by minor driving problems. The rover is approaching the last stop before hitting the road, an outcrop dubbed Shaler . The approach to Point Lake on Sol 302 went well, allowing the arm to reach the outcrop of interest. I'm SOWG Chair again today, planning Sol 302. The MSL activities planned for last weekend went well, except for a ChemCam instrument problem on Sol 300. I'm not on shift in any tactical operations roles, but have been helping finish up important observations in the "Cumberland" area before we drive away next week. Yesterday I was Geology/Mineralogy Science Theme Lead for the first time in months, so I was a bit rusty. I was MAHLI uplink lead again for Sol 282, and helped plan images of the SAM and CheMin sample inlets to verify that samples were delivered properly. The drilling at "Cumberland" went perfectly . Sol 280 Update On Curiosity From USGS Scientist Ken Herkenhoff: Drilling Success! I was MAHLI uplink lead today, planning 3 sols to get us through the weekend. Sol 277 Update On Curiosity From USGS Scientist Ken Herkenhoff: Drill, Baby, Drill! Because the critical data from yesterday's plan won't be received until around noon Pacific time, MSL tactical planning starts later than usual today. It's good to see that the activities we planned over the weekend went well--the rover is now in position to drill the target "Cumberland." Today we planned 3 sols (271-273) in one day for the first time on MSL. I was SOWG Chair today for the first time since the conjunction stand-down. Both Mars rovers survived conjunction, when they could not be reliably commanded for most of April. For most of April, while Mars is behind the Sun as seen from Earth, no commands are being sent to MSL. I'm not scheduled in any tactical operations roles this week, but havebeen calling into planning meetings for both MSL (Curiosity) and MER(Opportunity). I was MAHLI/MARDI uplink lead again for Sol 227 planning, but againdidn't have much to do (just moving images between camera and rovermemory). At long last, the MSL team has resumed planning science observations!I was MAHLI/MARDI uplink lead on Monday, and although we didn't planany activities with those cameras, it was good to be involved intactical operations again. I'm scheduled as MAHLI/MARDI uplink lead again today, but there's nothing for me to do because the engineers at JPL are still working torecover from recent software anomalies. I'm SOWG Chair again today, but because anomaly recovery continues we are not planning science activities. I'm scheduled to serve as SOWG Chair today and tomorrow, but we won't be able to plan any new science observations because the recovery from the Sol 200 anomaly is not yet complete. Rather than continue with recovery efforts, MSL will be shut down due to intense solar activity. The engineering and instrument teams are working to set up MSL's "B" computer with all the parameter settings needed to resume science operations. As the MSL engineering team continues to study the Sol 200 anomaly, tactical science planning has been cancelled through this weekend. During Sol 200, MSL was unable to save data to part of its memory, so the rover stopped what it was doing and waited for more instructions. I'm scheduled as MAHLI/MARDI uplink lead 4 days this week. For the first time, I was SOWG Chair for a 2-sol planning session on Saturday. Planning was more difficult today because of power limitations. After taking a break from tactical operations for an MSL science team meeting (and a bit of vacation) last week, I'm back on as SOWG chair for Sol 195 planning. I was happy to see that first drill sample was successfully acquired on Sol 182, as shown in one of the MAHLI images I helped plan . 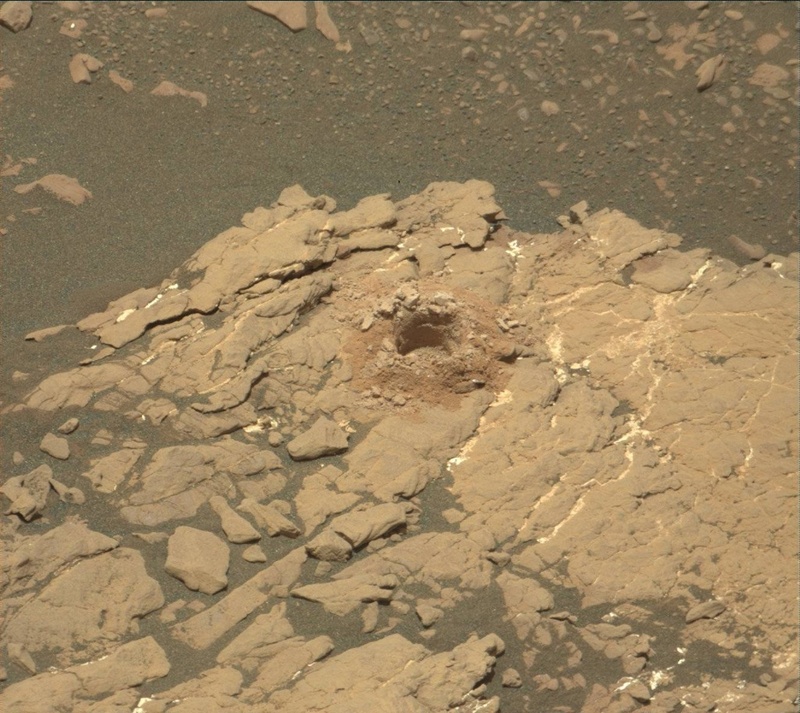 Sol 183 Update on Curiosity from USGS Scientist Ken Herkenhoff: First Drill Sample! The "mini-drill" test went well , so Sol 182 planning focused on the first full drilling activity. Planning is still "restricted," so we had an opportunity to acquire more ChemCam and imaging data on Sol 181 while waiting for confirmation that the Sol 180 "mini-drill" test completed successfully. Because the "drill-on-rock checkout" activity did not complete successfully on Sol 174, the MSL team had to work extra hard to determine how best to recover from the anomaly. As SOWG Chair again, I worked hard today to fit as many observations into the Sol 175 plan as possible while leaving enough energy in the batteries for Sol 176 activities. I served as SOWG Chair for Sol 174 planning, which includes the first use of the drill on Mars. Preparations for the first drilling activities continue to go well. I was MAHLI/MARDI uplink lead again today, planning images of potential drill targets. Today is the 9th anniversary of Opportunity's landing on Mars. We have arrived at John Klein , the location selected for the first use of the drill! There are multiple potential drill targets in front of the rover, which must be flat as well as scientifically interesting . The Sol 159 "bump" went well, and we received the images we needed to plan ChemCam, MAHLI, and Mastcam observations in the new location. For Sol 159, we planned MAHLI imaging of one more rock outcrop before stowing the arm and driving about 1 meter backward. I was SOWG Chair for Sol 158 planning, and it was an exciting sol. I was MAHLI/MARDI uplink lead again for Sol 153 planning, but there were no MAHLI or MARDI observations in the plan, so I focused instead on advance planning for Sol 154. A short "bump" toward slightly younger rocks in front of the rover was planned for Sol 151, and no MAHLI observations were included so I had an easy day as PUL. The short drive went well, so lots of "contact science" was planned for Sols 149 and 150. Because MSL planning is "restricted" these days and we planned a drive on Sol 147, we could not accurately point at targets on Mars on Sol 148. After the holiday hiatus, the MSL operations team sprang back into action to plan Sol 147 activities.